The results are in for the inter-school competition ‘Toolbox Challenge’. The top prize in the engineering section went to Rangitoto College student James Thompson. Blue Mountain College student Tom Hancox took out the furniture section, as well as the People’s Choice award. 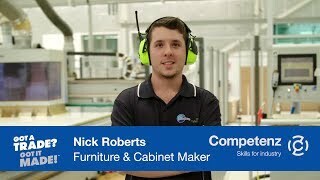 The ‘Toolbox Challenge’ is a nationwide engineering and furniture competition created by our Careers team and open to all schools that offer engineering or furniture subjects in years 11 to 13. Among the many entries of engineered widgets are furniture pieces including a stylish storage unit and a curved lid toolbox. “The Challenge is designed to build excitement around trade-based subjects and complements the national curriculum. It’s a fun way for students to work towards unit standards while gaining exposure to an industry-based challenge,” says Competenz Schools and Careers Manager, Joanne Verry. The furniture part of the Challenge tasks students to design and build a piece of furniture that includes at least one curved component and a hidden storage compartment. Blue Mountain College in West Otago entry’s in the Challenge is a timber storage unit from Year 11 student Tom Hancox. “Along with Tom’s design, his year 11 class made clocks and also set up a production line working in small groups manufacturing Cape Cod chairs that have been sold to raise money to buy new tools for the workshop,” says Blue Mountain materials, technology and design teacher Martin Murrell. Finalists were judged against other schools by industry professionals including representatives from Competenz and also a public vote. There were $10,000 worth of prizes to be won for students and schools including tools and equipment.